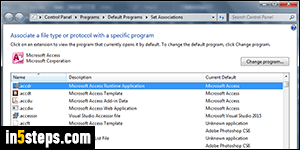 File types / extensions and protocols are registered open with a specific, default program. 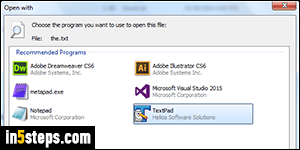 There are three ways of force-open a certain file extension with a particular program: once, without changing defaults (from Windows Explorer or the program itself), by changing defaults from Windows Explorer's context menu, or by changing file associations from the Control Panel. (A fourth would be to do that from the app's preferences dialog - many programs include that functionality.) Note: you can make Windows 7 show hidden file extensions. 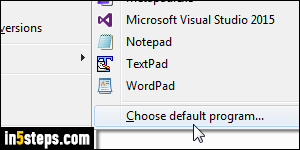 To open a file differently, but without changing any default, open that file from the program itself: if it doesn't show the file, choose to show "All Files" from the dropdown you see in the Open dialog. 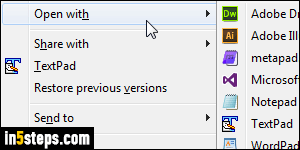 To do the same thing from Windows Explorer, right-click on the file: you may have some programs listed in the context menu itself (like TextPad, in my case). Either way, click on the "Open with" submenu and select an application - no file association is changed! If the "Always use the selected program to open this kind of file" checkbox is checked when you click OK, that file type will always launch with the application you picked. Otherwise, it will open with it just this once, and should now be listed in the "Open with" submenu seen above. If a program hasn't registered itself during installation as a valid file handler for this particular extension, doing what we just did is the only (easy) way to add it to the list! 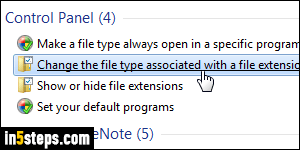 To change file associations from the Control Panel, type "file association" in the search field and click on the "Make a file type always open in a specific program" result. When the list of file extensions and protocols (listed at the bottom) has loaded, find the one you're interested in, click on it, and click on the "Change program" button to create a new association. The "Set your default programs" link shows what we did in Set your default browser in Windows 7.